The amiable and kind Golden Retriever temperament makes this breed a popular family pet in America. Golden Retrievers are the third most prevalent dog in the United States according to the American Kennel Club. However, make sure to do your research and ensure that the Golden Retriever temperament will fit your lifestyle. Do not acquire a Golden Retriever simply because it is a trendy breed at this point in time. 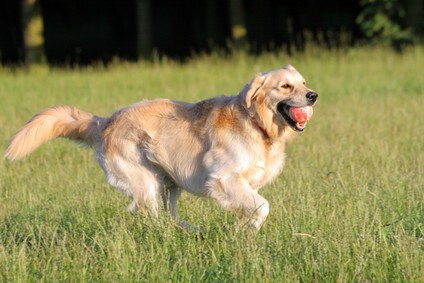 Golden Retrievers are large, energetic sporting dogs that need a lot of time and attention. Adding a big, bouncy dog to your household is not a decision that should be taken lightly. 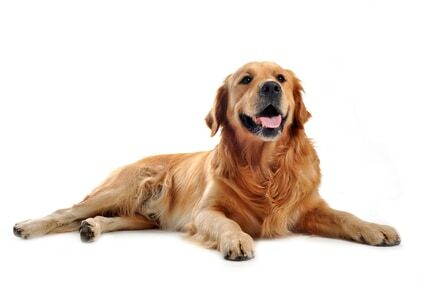 In this article, we will take a closer look at the friendly Golden Retriever temperament. 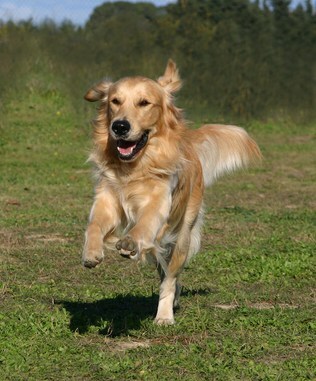 Golden Retrievers are part of the Sporting Group. They were originally bred for hunting. Therefore, your Golden Retriever will have a moderately high energy level and will need an outlet for its energy. Although they are not as exuberant as some working or herding breeds, such as Border Collies or Australian Cattle Dogs (ACDs) Golden Retrievers are active, athletic dogs. If you expect your Golden Retriever to lie around the house all day, you will likely have a bored and destructive dog on your hands. 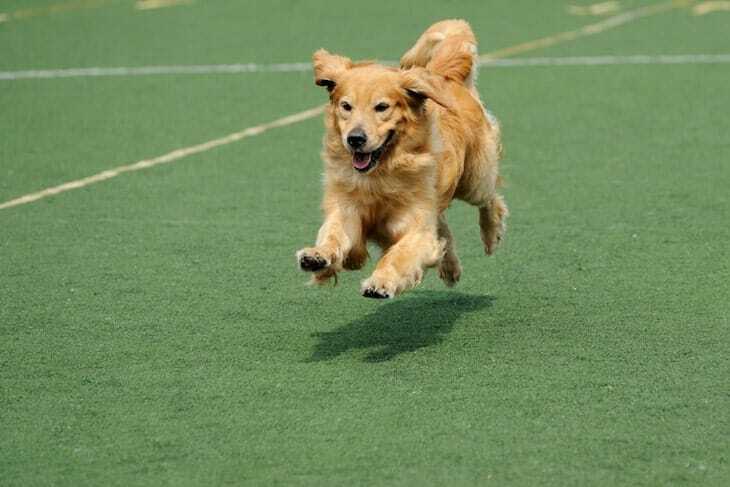 Golden Retriever exercise is extremely important. Make sure to set aside at least 30 to 45 minutes of aerobic exercise each day. Golden Retrievers love to go for long walks and jogs with their owners. One of the best ways to exercise your Golden Retriever is with a long game of fetch in the backyard. As their name implies, these dogs are excellent retrievers. One of the best ways to keep your Golden Retriever from getting bored is to provide him with plenty of toys and mental enrichment. Rotate his toys periodically to keep them interesting. Visit your local pet supply store to find an array of interactive toys such as Kongs, busy balls, kibble nibbles, food puzzles, and many more. Teach him novel tricks to make him use his brain. Golden Retrievers are loyal dogs that bond deeply with their owners. Many owners report that their dogs suffer from separation anxiety when left alone. If your Golden Retriever shows signs of separation anxiety, consult with a professional positive reinforcement trainer. Increase your dog's exercise and always leave him with something to do when you leave the house. You can use calming pheromones such as Dog Appeasing Pheromone (D.A.P.) to reduce your dog's anxiety. If possible, bring your dog to a Doggie Daycare when you have to leave him alone for long periods. You can also hire a dog walker to come over and check on your dog in the middle of the workday. Follow an approved training plan for crate training to give your Golden Retriever a safe place when you have to leave. This will help your dog feel more secure and it will also prevent destructive chewing of your belongings. Golden Retrievers are very social dogs. They love to be the center of attention and they love to be around people and other animals. 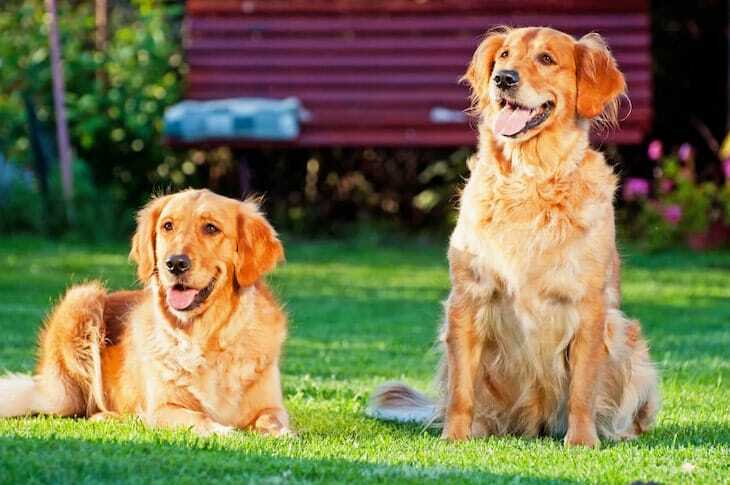 In general, Golden Retrievers tend to get along well with other dogs. This is especially true if your Golden Retriever is socialized from a young age. Golden Retriever puppies should stay with their mother and the rest of their litter until they are at least 8-10 weeks old. This is crucial for learning bite inhibition and other important canine social skills. If you acquire your dog as a puppy, sign up for a puppy kindergarten class. Even if you adopt your Golden Retriever as an adult, you can still socialize him by giving him treats to form a positive association with other dogs. Golden Retrievers are a popular choice for families with kids. The trustworthy Golden Retriever temperament makes this breed an ideal choice for households with kids. However, it is crucial to socialize your Golden Retriever with children and always supervise all interactions between dogs and kids. Never leave a small child alone with a dog of any breed. It is also important to instruct the child on calm, gentle, respectful dog handling because no dog should be expected to tolerate rough manhandling from a child. It is up to the parents to manage all interactions between children and dogs to make sure that everyone stays safe. If you are looking for a breed that will adapt to a household with other pets such as cats, rabbits, ferrets, etc., the Golden Retriever will probably be a good choice. Although not every Golden Retriever is safe around cats, many Golden Retrievers coexist peacefully with felines and other critters. Follow a slow introduction process to acclimate your Golden Retriever to the other pets in the household. Always supervise their interactions closely and never leave them together unsupervised. When you need to leave the house, separate your dog by placing him or her in a crate or behind a baby gate. Every adopter has a personal preference, but most professionals feel that there are no major differences between male and female Golden Retriever personalities. Work with a rescue group or breeder to find the dog that is right for your family and try to be equally open to both males and females. Golden Retrievers originated in the Scottish highlands in the 1800s. They descended from a now extinct breed called the Yellow Retriever. The Yellow Retriever was crossed with other hunting dogs and hounds to create the modern Golden Retriever breed. Golden retrievers entered the show circuit in 1908. Their popularity as American household pets exploded in the 1970s. Visit the website for Golden Retriever Club of America for more interesting Golden Retriever facts. The intelligent Golden Retriever temperament makes this dog a fairly easy dog to train. These dogs are sometimes even trained as guide dogs for the blind and service dogs for the physically disabled. 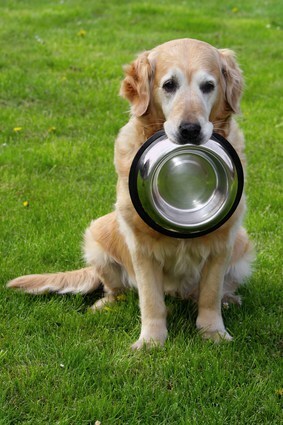 Golden retrievers are food motivated and they respond well to positive reinforcement training methods. Never use harsh punishments or painful training tools such as shock collars, pinch collars or choke chains. In terms of Golden Retriever temperament problems, one issue that sometimes arises is your Golden Retriever jumping up and biting at hands or clothing. This behavior is usually a product of too much pent up energy. 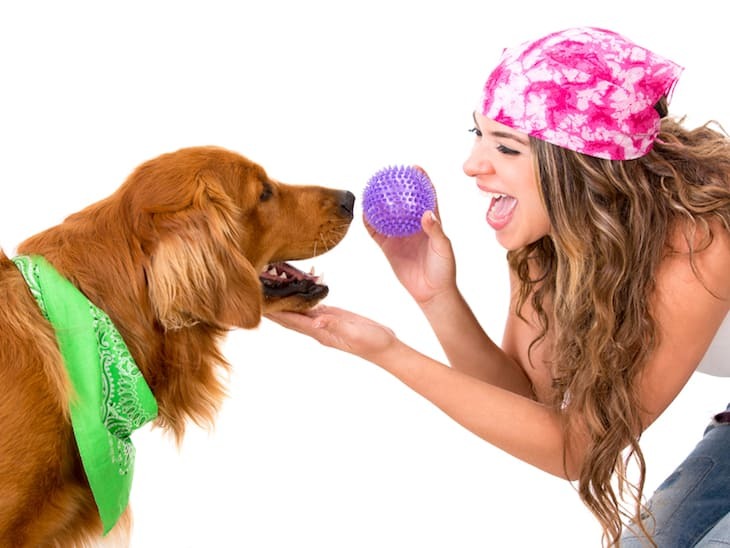 Your dog is probably not trying to be aggressive; he is most likely trying to play. Try increasing exercise and training. If the problem persists, consult with a professional positive reinforcement trainer. Golden Retrievers are large and athletic. The typical Golden Retriever weight is 65-75 lbs for males. For females, the average Golden Retriever weight is 55-65 lbs. The average Golden Retriever height is between 21 and 24 inches. Other Golden Retriever traits include droopy ears and a gentle expression. They also have long, flowing coats and feathered tails. The long Golden Retriever fur is one of this breed's distinctive qualities. Golden Retriever color can be anywhere along the spectrum from white to red. A Shorthair Golden Retriever does not occur naturally. Rather it is a popular Golden Retriever haircut. Yes, Golden Retrievers shed moderately throughout most of the year and heavily once or twice per year during shedding season. Frequent bathing, brushing and grooming can help reduce shedding. However, some shedding will still occur. Therefore, if you are a person who cannot tolerate dog hair in the house, this breed is probably not the right choice for you. No, this breed is not considered hypoallergenic. They are not a good choice for owners who suffer from allergies to dog dander. Unfortunately, this beloved breed is prone to many health issues. The most devastating of these health concerns is cancer. Golden Retrievers are very susceptible to developing cancer as they age. Like all dogs, your Golden Retriever should visit a licensed veterinarian at least once a year. Make sure your dog is on flea and heartworm prevention at all times. Spaying and neutering is highly recommended and most breeders will ask you to sign a contract promising to spay/neuter your pet at the appropriate age. Adopted Golden Retrievers are almost always spayed/neutered prior to adoption. Talk with your veterinarian about Golden Retriever health concerns before you acquire one. Make sure to discuss early signs of cancer for prompt cancer detection. If you bring a Golden Retriever into your life, make sure you have the financial stability to handle vet bills. In general, mixed breed dogs are healthier than purebreds. If you are worried about the health problems of this breed, consider adopting a Golden Retriever mix instead of purchasing a purebred. With excellent care, a typical Golden Retriever lifespan is between 10 and 12 years. Note: if you agree that your health and your dog's health should be a top priority then get a copy of The Ultimate Guide to Dog Health. Your Golden Retriever friend will love you for it. This guide will help save you money, time and most of all help you keep your dog healthy. 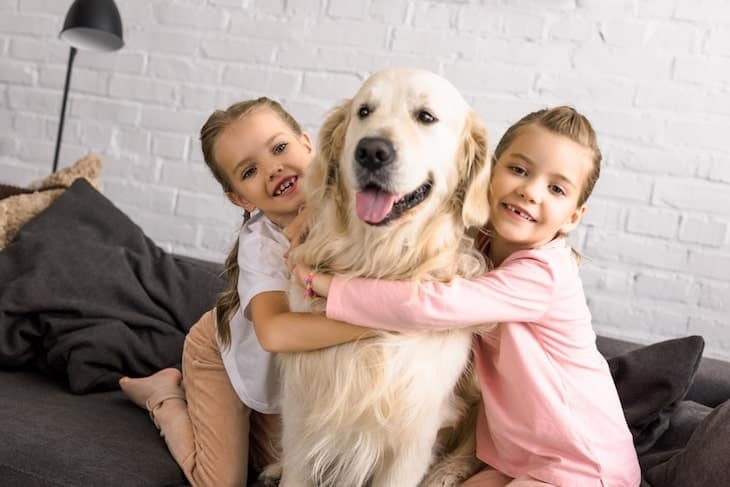 If you think a Golden Retriever might be the right choice for your family, look into Golden Retriever rescue groups before going to a Golden Retriever breeder. There are already many homeless dogs in this country looking for loving homes. Start your search with a visit to your local humane society or animal shelter. Let the staff know that you are looking for Golden Retriever or Golden Retriever mix. If you are open to other breeds and mixes, let them know that you are willing to meet dogs with Golden Retriever temperament traits. Ask to leave your phone number on file and be notified when eligible dogs become available. You can also search for adoptable Golden Retrievers online on websites such as Petfinder.com, Adoptapet.com and Getyourpet.com. There are even rescue groups dedicated exclusively to rescuing Golden Retrievers. Facebook and Google are good resources for finding Golden Retriever rescue groups. The Golden Retriever Club of America National Rescue Council is another great place to continue your search for the perfect dog. If you adopt through a rescue group or adoption center, the Golden Retriever price range will be between $75 and $200 depending on the organization. Dogs from these types of organizations will generally be spayed/neutered, vetted, vaccinated and microchipped prior to adoption. If you have decided to acquire your Golden Retriever puppy from a breeder, be sure to do extensive research to make sure you locate an ethical, reputable Golden Retriever breeder. Never purchase Golden Retriever puppies (or any puppies) over the internet or from a pet store. There are many unscrupulous breeders and puppy mills looking to make money off of these popular pups. The Golden Retriever Club of America offers a puppy referral service to help buyers find good Golden Retriever breeders. However, still be prepared to do your own research and visit the premises in person to see the environment for yourself and get a chance to meet the parents of the litter. Be sure to talk with your breeder about health concerns, genetic screening and medical records. Some breeders will conduct a Golden Retriever temperament test to help match the right puppy to the right home. Golden Retriever litter size can range from 4 to 12 puppies, so you may have to be patient while you wait for a puppy to become available. When you purchase a Golden Retriever for sale from a breeder, the Golden Retriever dog price will be between $800 and $3000. Golden Retriever cost varies widely depending on the breeder. The charming and confident Golden Retriever temperament makes this breed a beloved American favorite. However, adding a dog to your family is a decision that should not be taken lightly. Make sure that you can provide for a Golden Retriever's training needs, exercise needs and medical needs before bringing one into your life.